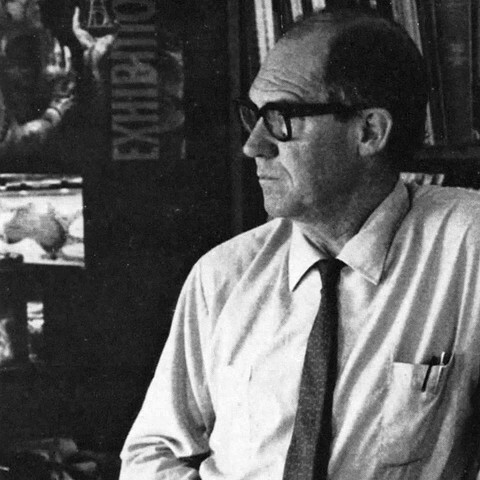 Portrait of Gordon Andrews (uncredited) from Design Australia 1967. As a young man in Sydney’s inner west Gordon Andrews showed an early aptitude for drawing and carpentry. His school days were not happy ones, as conventional schooling did little to support his creativity, but upon leaving school Andrews studied engineering, art and design at the East Sydney Technical College where his skills were nurtured and he flourished. His father, a stonemason who later studied mechanical engineering, was himself an inventor and designer. Andrews often acknowledged the debt he owed to his father for not only giving him the genetic ability to design, but for inspiring him to follow in his footsteps. At a time when Australian design was seen as parochial in outlook and execution, Andrews stood out as a designer of international style and sophistication. Andrews’ first role was as a junior commercial artist with an advertising agency in Sydney. The experience, confidence and credibility he gained soon allowed him to undertake other roles, including many overseas commissions. Andrews worked in advertising in London for several years before eventually returning to Australia in 1939. From 1949 through to the mid-1950s, he undertook commissions in the United Kingdom and Italy, where he found he was able to combine two of his passions; travel and design. In the early 1960s, having returned to Australia, Andrews worked on a number of high profile projects for the Australian Government. His design work included the interiors of the Australian Pavilion of the Comptoire Suisse trade fair (and other expositions in Paris, Tokyo and Cologne), the New South Wales Government Tourist Bureau in Sydney, and the New Zealand Government Tourist Bureau. Later commissions included designing the logo for the Reserve Bank of Australia, design work on the National Gallery, Parliament House and National Athletics Stadium buildings in Canberra, and various sculptures, fountains and civic projects in the ACT and NSW. At a time when Australian design was seen as parochial in outlook and execution, Andrews stood out as a designer of international style and sophistication. In 1963 Andrews was invited to submit designs for Australia’s new decimal currency banknotes, along with fellow designers Richard Beck, Max Forbes and George Hamori. The selection committee, headed by Russell Drysdale, voted unanimously for Andrews’ designs, and on 14 February, 1966, Australia’s new decimal $1, $2, $10 and $20 banknotes entered circulation. His designs were bold and each banknote captured a unique aspect of Australian life. Andrews was subsequently engaged to design the $5 banknote, issued in 1967, and later the $50 banknote, issued in 1973. When polymer notes began to replace paper ones, Andrews served on the advisory panel that oversaw their design. Shortly after Andrews’ death in 2001 his friend Alan James noted, ‘I know of no other currency that captures the rugged vibrancy and spirit of a place the way ours does. To his continuing credit, the new polymer notes reflect the spirit of the work he did’. As a designer, Gordon Andrews’ work ranged from the functional to the more conceptual. His international career included industrial design, furniture, jewellery, interiors, graphics, murals, exhibitions and photography. In 1955 his reputation as one of Australia’s leading industrial designers and a designer of international standing was cemented when he became the first Australian designer to be elected a Fellow of the UK Society of Industrial Artists and Designers. Other honours followed, including membership of the Faculty of Royal Designers for Industry, and the Alliance Graphique Internationale. In 1985 he was awarded the gold medal by the Design Institute of Australia. Gordon Andrews died in Sydney on 17 January 2001. He is regarded by many as one of the few renaissance men of the art world, being a designer, sculptor, painter, carpenter, photographer, cartoonist, silversmith and illustrator. He is widely acknowledged as one of Australia’s most prominent mid-20th century multi-disciplinary artists. This text was sourced from The Reserve Bank of Australia Museum.